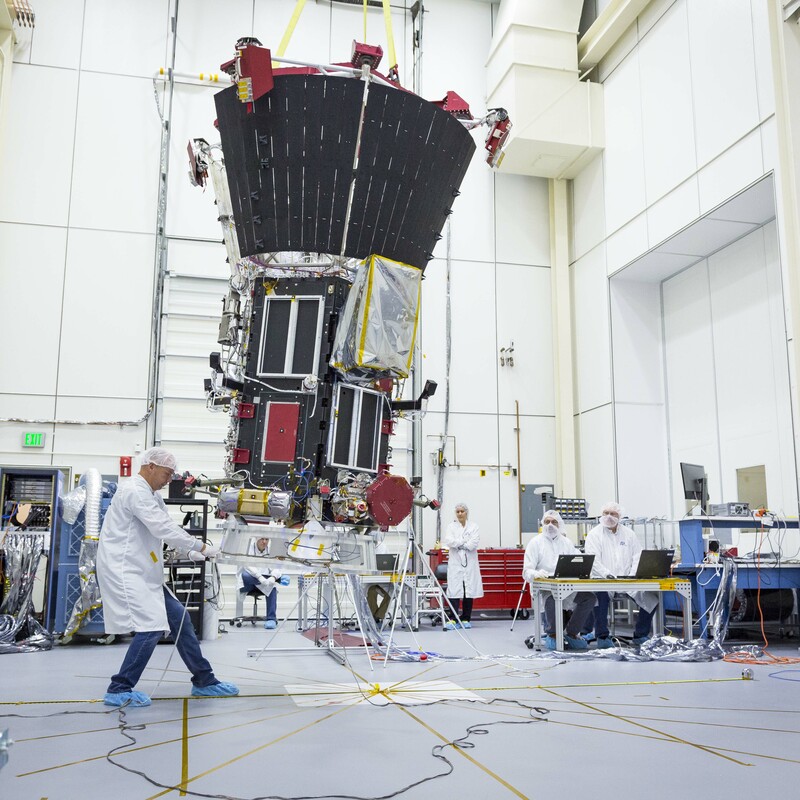 As NASA's Parker Solar Probe continues through its careful construction process, the spacecraft – built for NASA by the Johns Hopkins Applied Physics Laboratory in Laurel, Maryland – is approaching the final stages and running through a battery of tests to ensure it will be ready for its groundbreaking mission to the Sun next summer. An integral part of the process involves making sure that the instruments aboard the probe are working properly, especially given the extreme conditions they will be exposed to in outer space and near the Sun's atmosphere, called the corona. The instruments – many of which measure magnetic fields or are affected by them – also need to be calibrated to accurately measure the Sun, which means scientists need to know about the magnetic field of the spacecraft itself. In September, scientists and engineers involved in the mission monitored the spacecraft during one of the most nerve-wracking tests: the probe was hung from a crane several feet off the ground and swung back and forth – all in the name of science. "The best way to measure the spacecraft magnetic field is by swinging the spacecraft, and not moving the test sensors," said APL's David Jones, lead electromagnetic compatibility engineer. The nail biter of a test was necessary to measure the spacecraft's magnetic field, which directly impacts two of the investigations on board. Four major investigations on the spacecraft aim to provide researchers with a greater understanding of the Sun, specifically by tracing the flow of energy in the corona and determining why it is so much hotter than the actual surface of the Sun. Of those four, the Fields Experiment (FIELDS) and Solar Wind Electrons Alphas and Protons (SWEAP) are both sensitive to the spacecraft's direct current (DC) magnetic field. FIELDS will measure electric and magnetic fields and waves, so recent testing helped determine how much of the magnetic field measurements are coming off the spacecraft itself, versus those that FIELDS will encounter from the solar plasma. SWEAP will track the solar wind's electrons, protons and ions and measure their velocity and density. Plasma electrons may pass through the magnetic field produced by the probe's four Traveling Wave Tube Amplifiers (TWTA), which employ many small magnets inside, and can impact the velocity and direction of passing electrons. The swing test helped ensure both of these instruments would accurately measure critical data. "The swing test consisted of suspending [the] unpowered spacecraft from an overhead crane and measuring the magnetic field with several field test magnetometers, located at different distances while the spacecraft swung in pendulum fashion," Jones said. "The test magnetometers were setup in gradiometer mode which removes background magnetic field; therefore, any magnetic field variations were due to near field variations from the swinging spacecraft." Ensuring the integrity of the spacecraft's data collection is critical to the mission, even if the tests are sometimes difficult to watch, even from up close. "To see a billion dollar spacecraft hanging from a crane and swinging is nerve-racking," admitted Nelli Mosavi of APL, the engineer leading the magnetic cleanliness effort on the mission. "But we have the best mechanical team, and we had so much confidence that they [would] do a great job." Parker Solar Probe is about to be launched... into a gentle arc. By swinging the probe past magnetometers, the team can characterize the spacecraft's own magnetic field.